Fable: The Lost Chapters has finally arrived on the PC that features 25% more content, improved graphics and that same enjoyable gameplay which made the XBox version so popular. From beginning to finish, Fable offers gamers one of the most enriching RPG experiences of all time and rather than creating your own character, the player's character is automatically created and you start in the gaming world as a child. The beauty of Fable is that every action you make in the game goes a long way in determining your future gaming self. 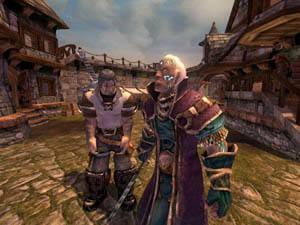 The game starts off in the peaceful town of Oakvale, a small town in the outskirts of Albion. Unfortunately for your character, your life is soon thrown into turmoil when a gang of ruthless bandits lay waste to the town of Oakvale. Although "everyone" in the town is now dead, your character somehow survived this disaster and you are soon found by Maze, a member of the hero's guild. The storyline revolves around a variety of mini-quests that ultimately lead you to find your long lost mother. Whether you are good or evil, this is still the main quest of the entire game. 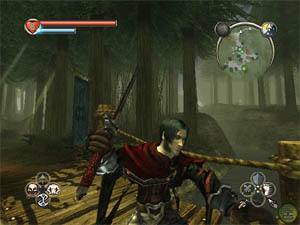 Although the control system of Fable is rather complex at first, the initial part of the game (from childhood to young adulthood) serves as a tutorial for the player. Whether it's kicking chickens or beating up your best friend, all the actions you engage in this title make a huge difference to the way the storyline plays out. For instance, if you become evil in Fable, characters in towns will be extremely wary of your character and they will cower, hide or even run away from you. However, if you act heroic, the characters will basically think that Michael Jordan has come to town and treat you like a demigod. Your character isn't also limited to just one character class but the games developers have taken on an eclectic approach in that your character has access to melee attacks, archery and magic. Fortunately these skills are slowly introduced into the game and by the end of the game, you will be heavily relying on magic to get you through. The combat system of Fable uses a real-time fighting system that allows your character to lock onto an enemy, switch between weapons or magic and basically beat your enemy to a bloody pulp. This is easily the most impressive feature of the game because you can virtually attack a character with a sword than unleash a plethora of spells on the next victim. As per usual, Fable uses an XP system of experience that basically awards your character for completing quests or killing monsters. This also allows you to increase your strength, will power and skill points. You can even focus your points on magic or if you prefer, your melee fighting. The gaming world of Albion is also quite huge and your character can virtually do just about anything from "dropping his guts", marrying or even buying that small farmhouse that you've been dreaming about. Your character also changes quite dramatically throughout the game, from getting tattoos or changing your hairstyle, this game has it all. Graphically, Fable is a very impressive game on the PC (more so than the XBox version) and is easily one of the most graphic intensive RPG title out there. All the characters in the game contain a fairly high polygon count for that extra realism and match that with some high quality textures and you could be forgiven in thinking that you are watching the next Lord of the Rings movie. As this game is considered a real-time RPG, your character even ages as the game slowly progresses. Another impressive feature of the title are the amazing spell effects that range from stunning to amazing. The musical score of Fable has also been majestically created and perfectly suits the RPG genre of this game. The character voices in the game have also been professionally done and nothing sounds too contrived or forced. Add in a few special effects such as background noises (cities and forests), the sounds of battle and of course the powerful sounds of magic and you have one pumping sounding title. The title also supports in-game Dolby Digital. In conclusion, Lionhead Studios have really created an amazing game that contains every element of the RPG genre with a few new twists. If you are looking for a well written and graphically impressive game with awesome playability than I would highly recommend Fable to anyone. Be a hero... or be a villain... just play the game already!